Thanks so much for your overwhelming cheer about yesterday's news! Every comment made me a little more giddy, truly! I wanted to title these posts "Before," but as I've yet to pick up a tool inside the house or make any strides toward an "After," that seemed a bit premature. We'll go ahead and title these posts House Tour, then, with the expectation that I'll one day link back to them and dazzle you with a house makeover montage. 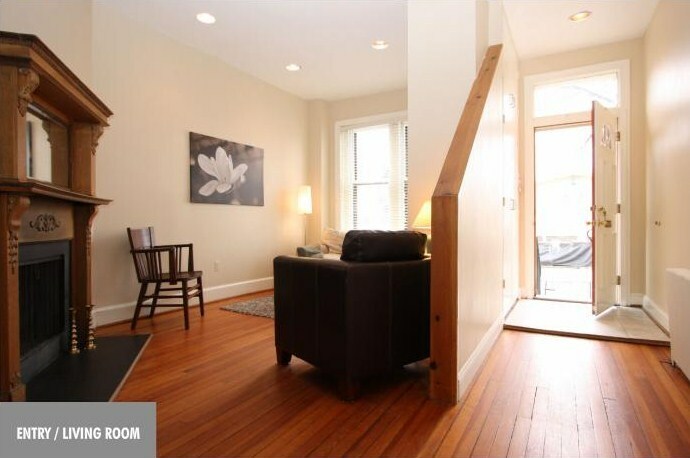 These images are all courtesy of the sellers' agent. Red pine floors original to the 1906 house... yes please! See those great windows behind the table? This is the clearest picture you'll get of them for now. You can actually walk out onto the landings... I've never seen windows like quite like them. As an end unit the house is flooded with light all day long. Now we're going to turn right and peek into the living room. Our inclination is to substantially open up this room. We're itching to tear down that weird half-wall, and will probably alter the large closet/built-in unit, too. The room's just begging to be bigger, you know? The way the room is structured now, it's a tight squeeze in there. Not mention all the "I can't believe I bought T that enormous TV for his birthday" angst that comes up for me. We think knocking down at least one of the walls is going to do wonders for the space. I love that we have a fireplace, and I appreciate the historic mantel, but I do not love this particular mantel at all. I've already started poking around in architectural salvage stores for something different, without a mirror on top. The fireplace and wall angle separates the living room from the dining room. 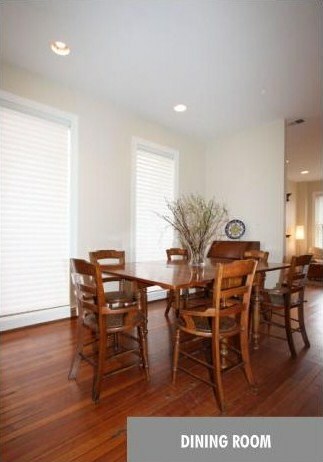 One of the things I'm most excited about is finding a dining room table. I gravitate toward rustic tables paired with more streamlined chairs. See the recessed lighting above? It's all over the downstairs, and it's all done incorrectly. One big project will be to get the wiring under control and have a lighting plan. The sooner we do that, the better... because I'm ready to start shopping for the perfect rustic chandelier to hang over the dining table. I'd love to hear any ideas you have or stories from your own living room and dining room renovations! Very exciting! I recently found your blog and can't wait to see what you do with these spaces. Congratulations! The floors are heavenly. 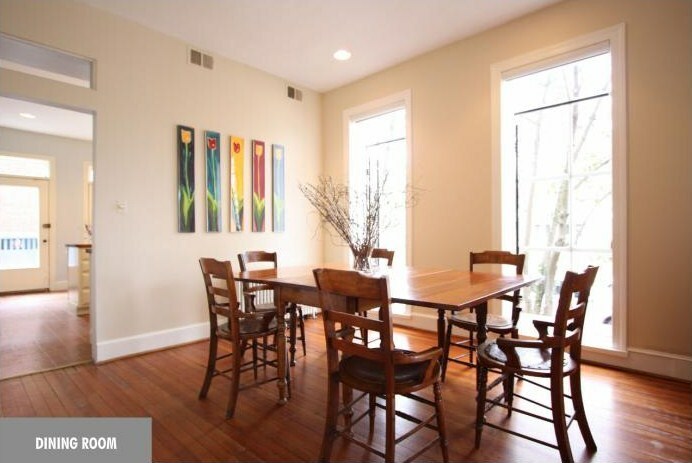 And the nearly floor to ceiling windows in the dining room are awesome. I love it! It's gorgeous already but I can't wait to see your changes. It looks wonderful! 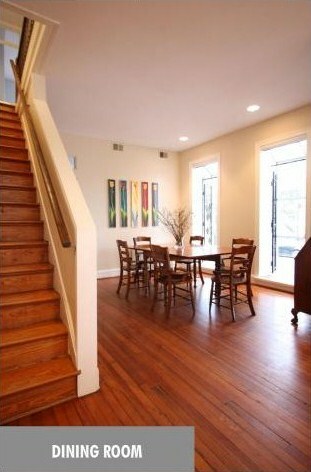 I love the floors and all the light. 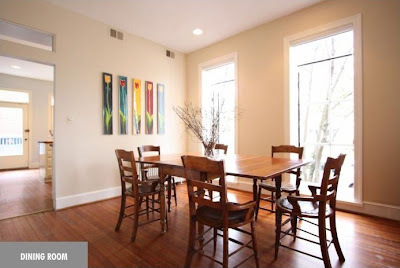 The size of the dining room with those door-windows is drool worthy! I can't wait to see what you do with the space and see the rest of your new home. I'm in love! It's completely gorgeous. I have a rustic dining room table hand made right here in East Tennessee for a song- maybe you need to get down here and order one. . .
Beautiful! The light is amazing. And of course I can't wait to see the kitchen! So jealous of the natural light you have in your new home! The back of our house (where we spend most of our time) gets no light except during the hours of 7am and 10:30am. Yuck. We'll definitely consider this when we buy in the future. It looks great! The floors and windows are amazing. I agree about tearing down the wall, it's a little akward. Our house didn't have recessed lighting but all of the light fixtures were horrible cheap 90's dome fixtures. We've already replaced the dining room one with a hanging drum shade over the table and we're working on changing out the others. Luckily lighting is a pretty easy fix. Our big project right now is chainging out our electrical panel. Our house was built in the 70's and the panel model has caused house fires before. But changing it will be a project. However, it costs 1/3 as much to do it yourself. Oh the floors. And the first thing I said to myself, when I saw your house photo was, "Ooooh it will have a lot of light.." As for dining rooms, I love a fab chandelier, and I like a mix, i.e. rustic table with ornate chandelier, or fancy French polished table with mid-century light overhead. Love! I think the idea of knocking out that wall by the door will really open up that space and give you so many more layout options. 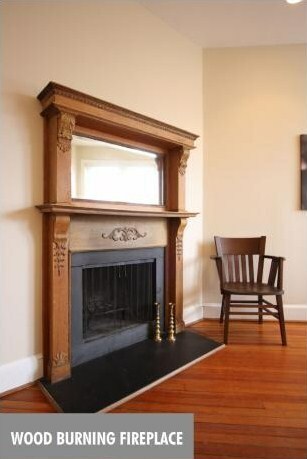 And I like the fireplace surround - agree with you on getting rid of the mirror above. 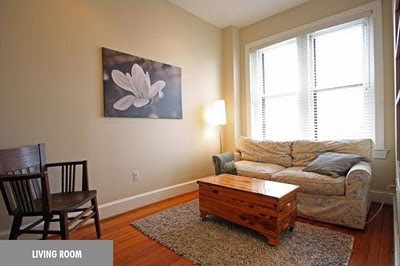 Any way you could just take that top portion/mirror surround off? Congrats again on the new place!!! So exciting!! the windows and the floors are awesome. so much light! we also have random recessed lighting- in the living room though. i'm looking forward to seeing what you do with the space! your new home looks beautiful based on this little peek! my husband and i are house hunting in chicago, so i've enjoyed hearing about your real estate adventures. congrats on finally snagging one!